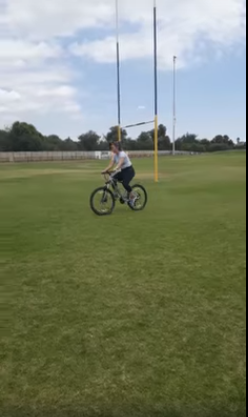 Marelize Horn, the young woman who’s cycling accident created a media firestorm after a video of her crashing into the goalposts on a rugby pitch in Windhoek went viral on social media, is an aspirant missionary who also wants to go and work as an au pair in the Netherlands. To be able to ride a bicycle is an essential skill for any person who wants to live and get along in the Netherlands. 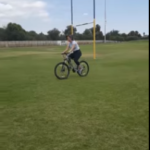 In preparation for Marelize’s aspirations to travel and work in Holland, mother and daughter decided that a rugby pitch would be the ideal place for her to learn to ride a bicycle. Desperate to see where normal instruction lacked, Marelize and her mom decided to make cell phone videos to review possible mistakes afterwards, but things went horribly wrong and the rest will from now on forever be part of viral video history. Her mother who can be heard saying: “My f@k Marelize…” near the end of hilarious viral video has started a new trend amongst especially Afrikaans speaking people. Within days of the video surfacing on social media platforms, the acronym ‘MFM’ is already as widely used as ‘LOL’ by some social media consumers. Marelize visited the studios of Informanté Radio and during an interview with Hannes Kaufmann she tells the entire story behind the hilarious viral video. A clip of the interview will be posted on Informanté’s Facebook page shortly.